A built-in wireless interface coupled with fast color and black print speeds make this All-in-One the perfect choice for your home office or small office! Help save time and money by producing your own high-quality, professional-looking business documents at an impressive print speed of up to 19ppm - Up to 4X faster color printing than competing color laser All-in-Ones! Plus, it has a USB Direct Interface to print from or scan to your USB flash memory drive! or print from your PictBridge-enabled camera, too! 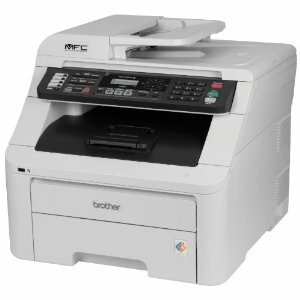 Help increase your productivity with fast print and copy speeds of up to 19ppm. Produce your own professional-looking business documents at up to 600 x 2400 dpi resolution using Brother Digital LED print technology. Built-in wireless and Ethernet network interfaces to install on a wired or wireless network or connect locally to a single computer via USB. Equipped with an adjustable 250-sheet capacity letter/legal paper tray, it also includes a single-sheet manual feed slot for envelopes or thicker media. 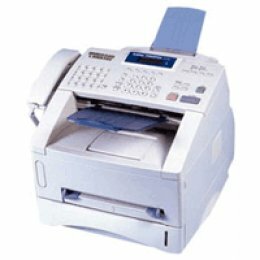 Send faxes from the All-in-One or your computer. Use the document glass or the 35-page capacity auto document feeder for copying, scanning or faxing a single page or multiple pages. Up to 19200 dpi (interpolated), with a variety of "scan-to" features. Includes a USB Direct Interface to print from or scan to your USB flash memory drive or print from your PictBridge-enabled camera. With its space-saving design, it can virtually fit in any environment. A top-loading design makes it easy to install and replace toner cartridges.